The city’s bookworld may be dying. On the Sunday that preceded Independence Day, there were no booksellers in Daryajanj’s weekly book bazaar. “It’s closed for security reasons,” a paanwalla told me. I stood on the empty pavement and laughed. Trains were still chugging in Old Delhi station, chaatwallas were still frying tikkis in Chandni Chowk but this booklovers’ den was a security threat. I can live in a Delhi minus the Red Fort, but not minus its bookshops. Imagine, what if Daryaganj’s Sunday Book Bazaar were closed for good? What if the Bahris, of Khan Market’s Bahrisons, shut down their 48-year-old store and return to Pakistan? What if the John Mayall fan Mr Ajit Vikram Singh, of Basant Lok’s Fact and Fiction, burns his eclectic collection and turn the shop into a blues club? In The God of Small Things, Ms Arundhati Roy said, “Things can change in a day.” Sahi boli, things can change. Bookshops can close. Booksellers can disappear. I knew a guy who would set up his stall each Sunday just below the footbridge in Daryaganj. He was old, crafty and, unfortunately for the bargain-loving buyer, very aware of the value of his books. From the private collections of Civil Lines bungalows, he would get me the most rare editions: Jane Austen’s Sense and Sensibility (1879), John Milton’s Paradise Lost (1860) and the most precious – all volumes of the 9th edition of Encyclopedia Britannica. Published in 1911, this edition is the best if your primary purpose of reading is to seek pleasure. 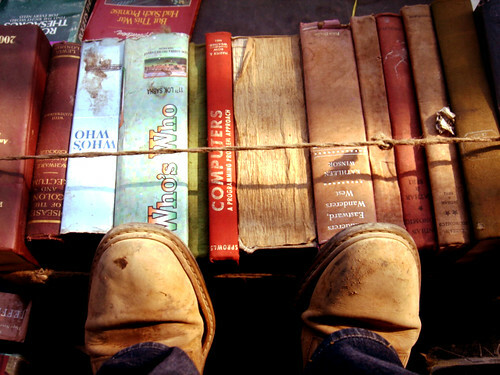 The volumes remained under my bed and I would use them only for weight-lifting. But I always planned to read them… one of these days. However, over the past few months, I haven’t been seeing the old guy in his usual spot. Somebody said he has left the book business. I miss him. But worse things have happened. In Khan Market, a joote ki dukaan has replaced a coffee table bookstore. Mr KD Singh’s store, charmingly called Book Shop, has moved to Jor Bagh, where it must be missing Khan Market’s footfalls. In South Ex, there was a Crossword bookshop atop the Ebony showroom. The then President Mr KR Narayanan was a regular there. He has died, and so has that store. Meanwhile, Bookworm’s Mr Anil Arora, in CP, is threatening to close his store due to lack of business. In August this year, my library was flooded with rainwater and some of my volumes of Encyclopedia Britannica were ruined.